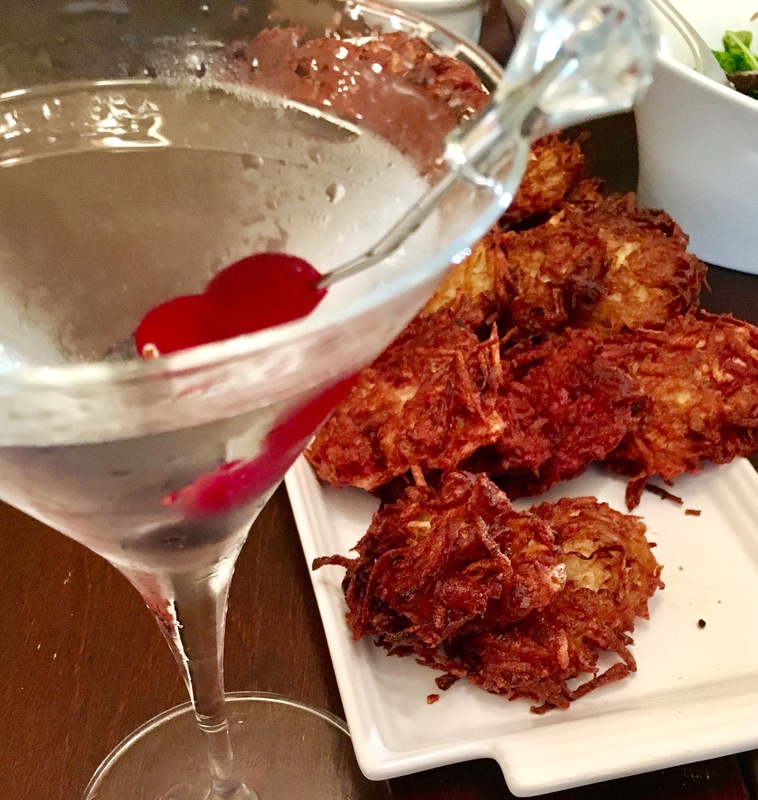 Happy Hanukkah: Vodkas and Latkes! – Eat, Drink, and Go! 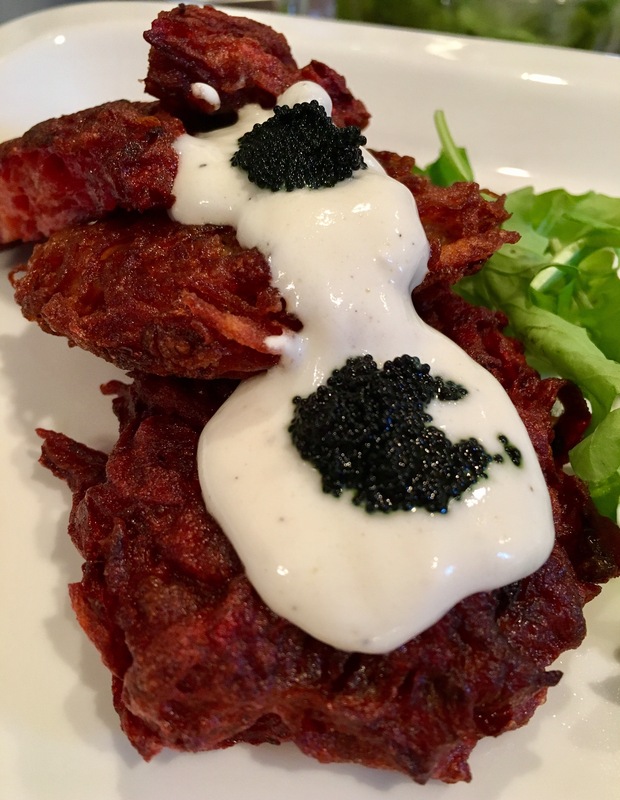 Happy Hanukkah: Vodkas and Latkes! Not only because it rhymes, but also because it’s a fabulous excuse to pair food with vodka! Just be sure to make the vodka drink after the fry-fest. No one wants a grease fire for Hanukkah. With the Jewish faith comes a heaping ladle of tradition, and making latkes (potato pancakes) is one of them. Frying things symbolizes the endurance of only a smidge of oil miraculously lasting for eight nights when it should have only lasted one. 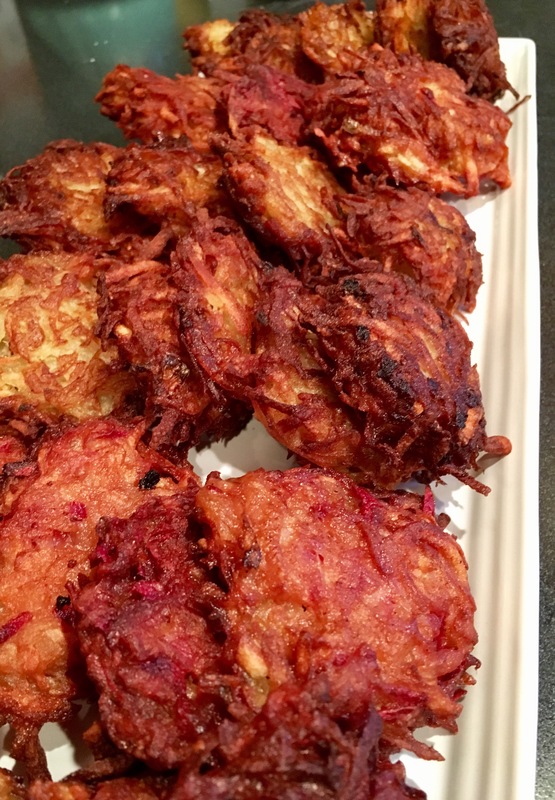 Some make donuts, but most do latkes. And they are divine!! I love potatoes all ways, but you know the whole carbs thing. We make ours by feel, like our grandma did, our mom, and all our matriarchs before them. But generally, we shred up the taters (my sister does the bulk of this now – somehow she always has the best shredding skills and I’m a little shredder-shy after a thumb shredding incident a few years ago). An onion adds the eternally decadent smell, an egg holds it together, and flour bulks it up. 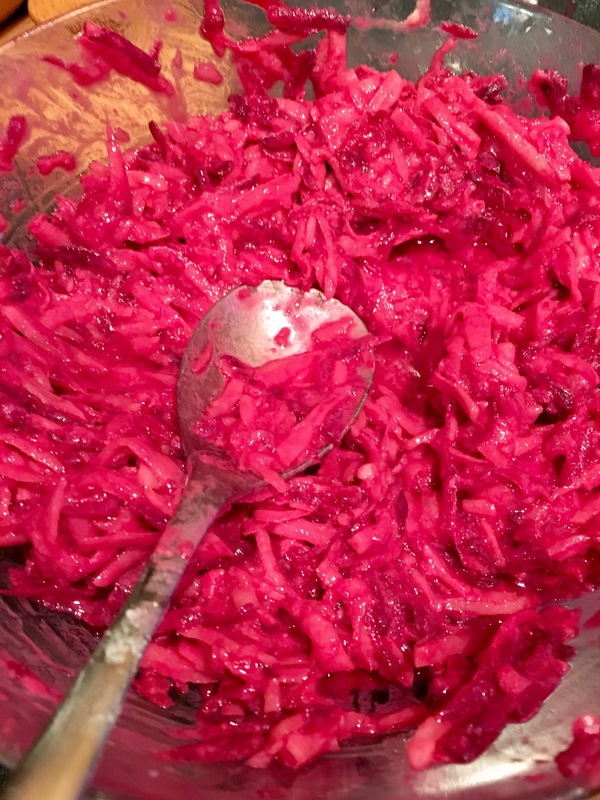 We often try new twists to our latkes and this year, it was beets!! They shred up just like the potatoes so it was a very easy addition to imagine. And oh how wonderful to add a healthy component to these fry babies!! 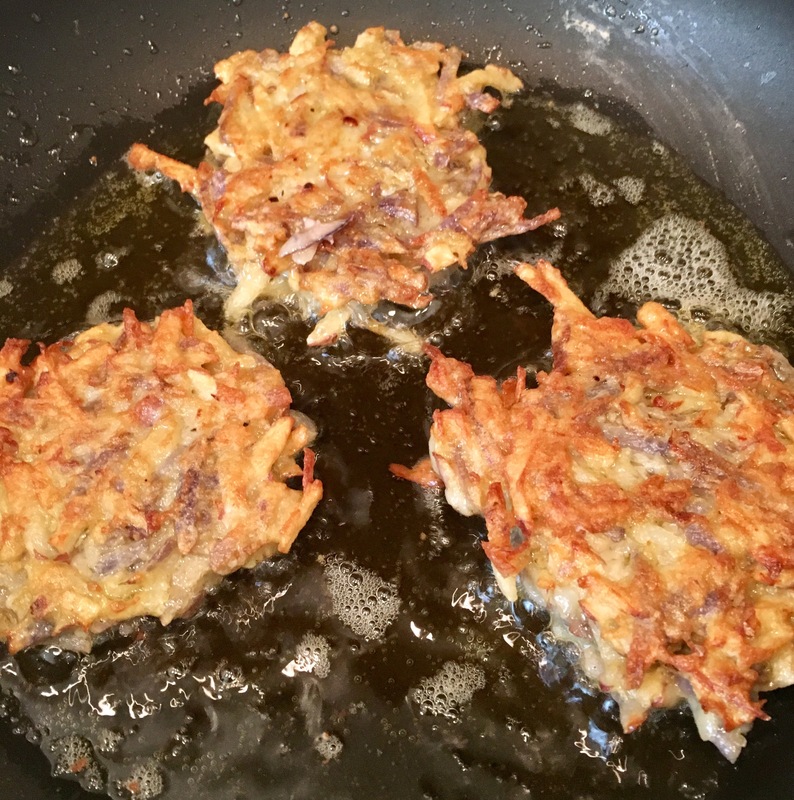 The frying adds the element of danger – gotta get that pan reeeeeeeaal hot for perfect latkes. Often we have some early casualties from the oil not being ready or the consistency being just a little off, but this year, all held together well!! We did just beets, just potatoes, and beets mixed with potatoes and all were equally mouthwateringly delicious. We keep them warm in the oven along with my mom’s amazing roasted lamb. 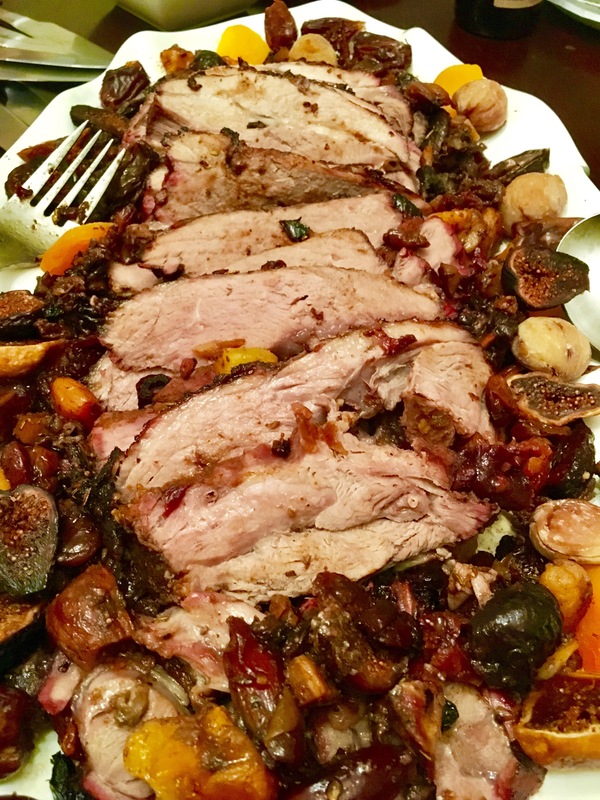 She trims it with dried fruits and nuts and it’s awesome. Between the latkes and the lamb, there’s a lot of happy “mmmmms” around the table! 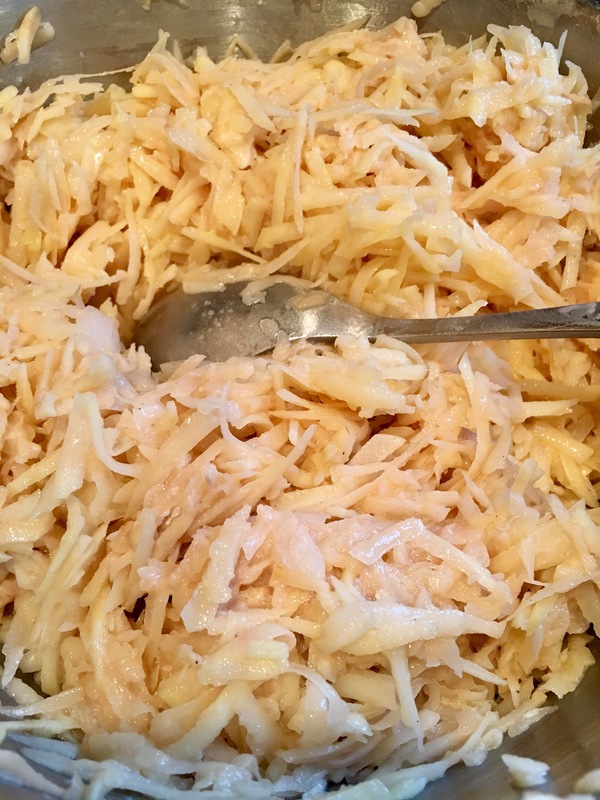 There are generally two camps for topping your latkes – the sour creamers and the apple saucers. I’m a sour creamer, but of course I have to kick up the sour cream a notch with – yes, you guessed it – Truffle!! I add just a little truffle oil and truffle salt. Then to be even more decadent this year, I spoon on the caviar!! I’m getting misty just thinking about the latkes. It’s so sad to only make them once a year. So wrong, but I guess it’d be like having Santa more ham once a year – it’d just lose some of the sanctity, right? We actually celebrate everything in my house being multi-faith among our spouses, but the latkes and the ladies in the kitchen frying away and greasing up the whole kitchen is one of my favorite holiday traditions regardless of faith. Luckily it wasn’t my kitchen this year! Let’s not forget the vodka! 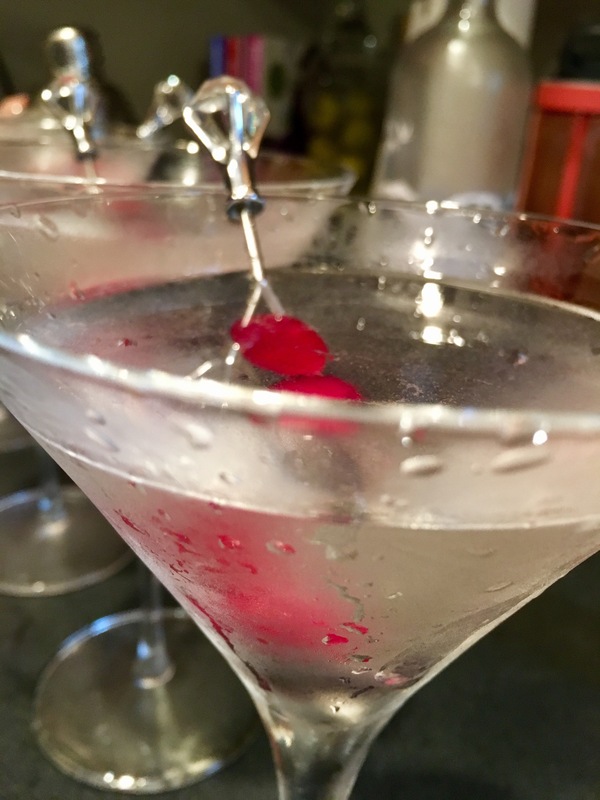 We went with a delicious white cranberry martini and it was just the right amount of sweetness to play off the salty savoriness of the latkes and lamb. Added a few frozen cranberries for garnish and the great thing about them is that they keep the drink nice and cold!! Yummmmm!!! I think this whole dish should be resurrected for Passover. Yes, biblical reference intended. It should be about by then that the smell of latkes has left the house!! Hehe!! It really does stick to you, like a lovers cologne lingering on you after a warm embrace, so too does the smell of having been in the kitchen making latkes all evening (only even more intense!!). I peeled off my clothes hours later at bedtime and still smelled very strongly of latkes!! 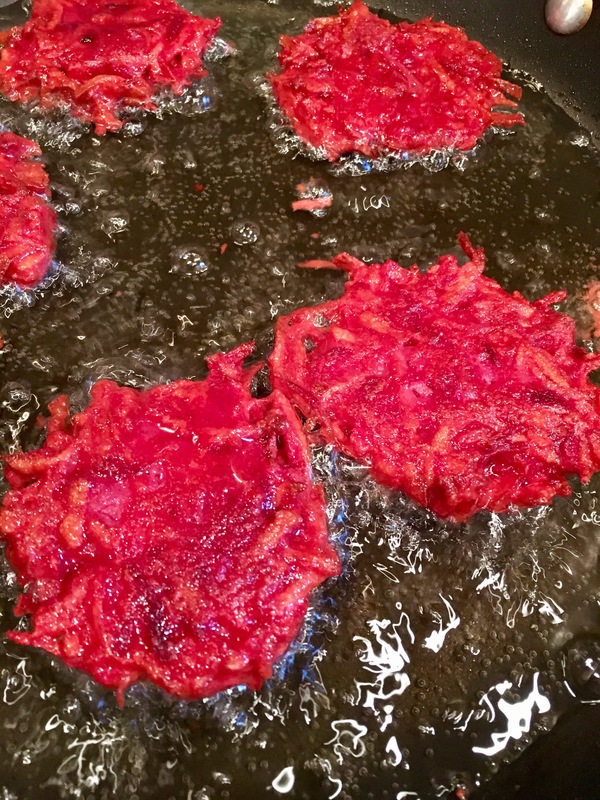 I breathed in the intensity of the latkes’ clothing and skin penetration, and that’s all til next year…or is it? Yay Stevie!!! I hope she is a foodie and somehow finds your fabulous blog, Girl!!! Having troubles with login, but your blog entries are great. I love the back stories you add about family, concerts with fab pictures by the way , traditions , mishaps ,advice and drinks your pair. Thnk you Go Girl!!! !